Four relatively new roads, built in the second half of this century, have had an enormous influence on Newark. They are the New Jersey Turnpike, the Garden State Parkway, Route 280 and Route 78. Each has helped the city, and each has created problems for it. While they are major access routes into Newark, Newark is not their terminus. Their purposes are more to serve the state and region. Fortunately, they connect Newark with that bigger and ever changing world outside. Nevertheless, the age of the city supreme is over. Maybe the Garden State should be rechristened the Transportation State, for neither Newark nor any of New Jersey's major cities monopolize New Jersey as they did in the l9th or early 20th centuries. Perhaps Newark, Jersey City, Trenton, Paterson, Camden and all the other urban areas are truly becoming part of the 'city of New Jersey' as people and resources flow back and forth from one region to another. We conclude our tour of Newark and examination of its streets and roads from the city's founding in 1666 to the brink of a new millennium with a segment on each of these four new roadways leading to and from our city. The New Jersey Turnpike was completed in the 1950s and has a major presence in Newark, cutting through the eastern part of town and passing the seaport and airport. It is one of the world's most important and busiest roads. Its Passaic River bridge at Newark was named in honor of Newark's Capt. Washington, one of the four chaplains lost in the torpedoing of the troopship Dorchester in the Atlantic in 1943. When driving along the Turnpike at Newark, you observe it is 12 lanes wide. Heading north from the Elizabeth line, you pass the Ikea Mall as well as the first terminal of Newark International Airport. To your right are the loading cranes of Port Newark and Elizabeth. Ships call here from all over the world. The airport, from which planes take off and land every few seconds, is to the left. The Continental hangar is especially noticeable as is the 1950s control tower. Off to the left is your first view of Newark with its 1930s and 1990s skyscrapers predominating. As you head north, you arrive at the great division in the Turnpike. At this point you pass under the steel cantilevered Pulaski Skyway and by the Essex County Incinerator which looms to your left. High-power tension lines follow the road for a distance. Out to the west are the spires of Newark's great Sacred Heart Basilica Cathedral. Next comes one last glance of Newark before exiting on 15W. Although the Garden State Parkway cuts through the western edge of Newark, it does not occupy as much land area as other roads. Basically, it parallels the western boundary of the city, cutting the Vailsburg section off from the rest of the city. It is beautifully landscaped throughout most of its length. In Newark, its sidelines are filled with close knit housing and portions of a very large, well-kept cemetery. Large signs along the route identify Newark, especially its cultural district and the Society Hill section of town. Route 280 brings traffic into Newark from the west through West Orange and Orange. When entering Newark it is six lanes with wide cement dividers and plenty of clear signs to alert drivers to the city's concert hall, hospitals, museum, colleges and universities, parks and recreational assets. Many overpasses loom overhead, for it literally cuts the Roseville section of the city in half, just as it cut the heart out of East Orange. Near First Street, Route 280 divides, one branch entering that city there, while the other heads toward the center of downtown Newark and onto the Meadows, Hudson County, Jersey City and the tunnels to Manhattan. As the road nears Newark, you pass the recently restored Broad Street Railroad Station, formerly the D, L & W depot. You can see the Newark city skyline to the right, observe the Colonnade and Pavilion apartments on the left, and during the ball season view the bright lights of Riverfront Stadium. Your one last chance to exit into Newark will take you directly to the New Jersey Performing Arts Center as well as Riverfront Stadium. After crossing the Stickel Bridge, you are in Hudson County and on your way to the Turnpike and the two Hudson River tunnel crossings. Route 78 is another way to come into Newark. As you pass through Millburn, Springfield, Vauxhall, Union and Hillside, you discover two sets of three lanes divided by concrete barriers. Green space with large trees and grassy hillsides border both sides of the road. As you draw closer to Newark, a long row of red apartments replaces the trees, and the hills give way to a mixture of residential and commercial properties. Soon this landscape changes into confusing mix of light and heavy industrial buildings. At that point, Route 78 splits. Immediately in front of you is the bustling airport. Continuing along in this direction, you merge into a spur of the New Jersey Turnpike, which will take you across Newark Bay and into Hudson County. Like the New Jersey Turnpike, Route 78 is an enormously important pathway for travel into New Jersey, capable of handling an incredible amount of traffic. 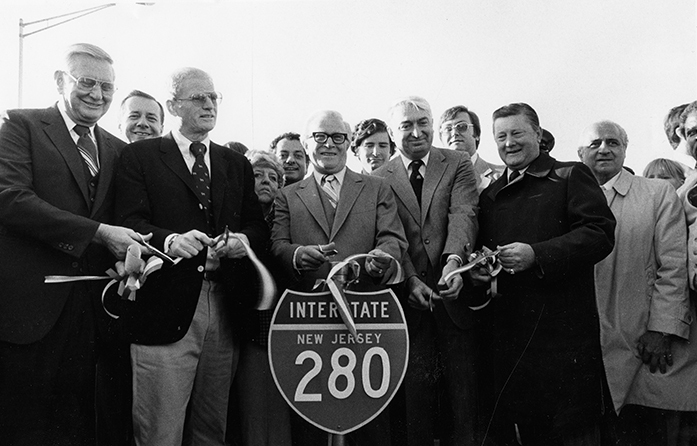 Like Route 280, it has its negative side when you consider what its construction did to Newark's Weequahic section. Still, it has created great advantages for the area as well as northern New Jersey. For one, it has opened up a large portion of the state, especially Union County, to increased development and enlarged the commercial influence of New York and Newark. And so, we have journeyed along some of Newark's major roads, viewing the contemporary sights. Three hundred and thirty-three years after Robert Treat laid out his Broad Street, Newark remains a vibrant center, in part because of all the roads that have merged into one of the nation's best designed road systems.